Original American Faro: The most popular game in the American Wild West. The turn of the faro card decided many man's fate for better or worse. Preferred game of outlaws and lawmen, Wyatt Earp, upon arriving in Tombstone, set up a faro bank. 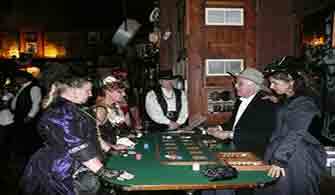 Doc Holliday, Luke Short, Lottie Deno, dealt faro in Denver, Kitty LeRoy, the best faro dealer in Deadwood c1870s. Faro was any and alls game. Men and Women called the Turn and in many a case their destiny. THIS INTERACTIVE FARO GAME IS AS FAST AND FURIOUS AS IT WAS IN THE WILD WEST. A table covered with green baize, bearing the images of a complete suit of cards, usually the spade suit. A dealing box, from which one card can be at a time without exposing those underneath. A case-keeper. This is a frame, like an abacus, used to show which cards in the pack have been played. One standard pack of 52cards.